Parts of Animals (or On the Parts of Animals; Greek Περὶ ζῴων μορίων; Latin De Partibus Animalium) is one of Aristotle's major texts on biology. It was written around 350 BC. The whole work is roughly a study in animal anatomy and physiology; it aims to provide a scientific understanding of the parts (organs, tissues, fluids, etc.) of animals and asks whether these parts were designed or arose by chance. The treaty consists of four books whose authenticity has not been questioned, although its chronology is disputed. The consensus in placing it before the Generation of animals and perhaps later to History of animals. There are indications that Aristotle placed this book at the beginning of his biological works. In Book I, Aristotle applies his theory of causality to the study of life forms. Here, he proposed the methodology to study organisms, and emphasized the importance of the final cause, design or purpose seeking a teleological explanation in the life sciences. 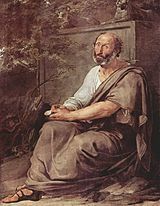 He criticized the dichotomous taxonomy practiced in Plato's Academy, since it did not allow for greater wealth than the process of gender bipartition. He concludes by defending the study of animals as a science as important as that of celestial bodies. He used those principles to study the primordial elements of the nature of which the bodies of animals are composed and the intrinsic conditions that make bodies become what they are. First they start from the combination of the fundamental elements of nature (earth, water, air and fire) forming tissues and these organs. In the rest of books, Aristotle studies the internal and external parts of the blood and non-blood animals, comparing them with human beings, showing the common and the specific. For Aristotle, the material causes of an organism could not explain all its aspects. To explain phenomena such as the processes an organism or its adaptations to the environment of the organism had to resort to the final causes, teleological explanations of those phenomena. In his Generation of animals, he explains teleologically reproduction and animal development. The Arabic translation of De Partibus Animalium includes treatises 11-14 of Kitāb al-Hayawān. ^ a b "Aristotle (384-322 BCE) | The Embryo Project Encyclopedia". embryo.asu.edu. Retrieved 2019-04-02. This page was last edited on 2 April 2019, at 23:36 (UTC).